“Shoot first and ask questions later.” It’s sort of how DanOCan.com operates. It is very rare that we know much about a place before visiting. Our style is much more about discovering an interesting place, doing some basic research about it to learn the history, and then move on to the next place. While I would love to be much more in-depth, the sad fact remains that this blog and associated YouTube channel make zero money so when you take away the hours spent working there isn’t much time to do it any other way. Ferintosh, Alberta was an interesting — albeit very short — stop for us on this road trip. 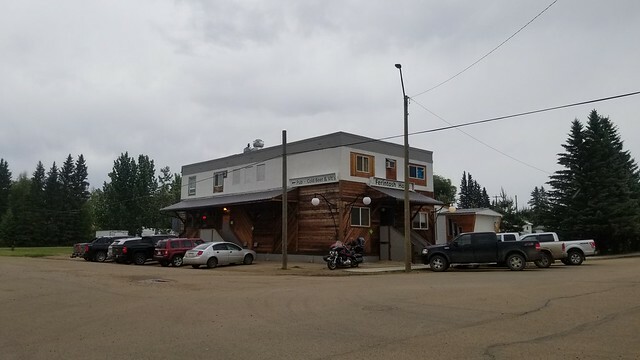 Located southeast of Edmonton and sandwiched between Little Beaver Lake and Highway 21, the town reminded us of Elbow, Saskatchewan; it’s the sort of place you feel relies heavily on the lake and recreational activities to keep it afloat. The post office in the area was established in 1910 and Ferintosh became a village in 1911. It was named by local resident Dr. John McLeod for a town in Scotland. The street one block north of Main Street is “McLeod Street”, and I’m willing to make the leap of logic to assume it is named for him. As far as small town exploration goes, the town hit three of my “Big Five” highlights — an old hotel, an old church, and an old school. All it was missing was an old service station and a grain elevator to complete the list. The church was the first thing we saw as we came into town from the north. Located right along the main roadway into town, it was hard to miss. Still in a fairly bright and vibrant white color, it stood out nicely against the green grass and trees surrounding it. The windows on the north side of the church have been modified over the years, with a couple of the arch windows removed and boarded over and replaced with more modern rectangular windows. One of the replacement windows lines up with the original whereas the second was installed where there was no window. Behind the church is parked a 1970s-era motorhome which, based on Google Streetview and some other images I found on the internet, appeared there around 2013. Speaking of the internet, I was surprised at the lack of information about this church online. As mentioned above, we normally count on coming home and doing some light digging online to learn more about these places, put this church is a bit of a mystery. Image searches reveal few results and there doesn’t seem to be much of a history attached to it. Very odd. The Ferintosh Hotel was the hub of activity in the town, at least judging by the number of vehicles out in front. We were short on time so we didn’t stop in, but it appears to be undergoing a lot of renovation work. While searching online, I found a YouTube video from a user named “honesteddie2112” which shows the hotel in 2004 and, frankly, it looked a lot better back then. A number of the windows have been replaced with smaller versions, the phone booth which used to be beside the front steps is gone, the robin egg blue color scheme has been replaced with grey, and there is now an overhang added to the side. The renovations appear to be ongoing so I won’t pass final judgement yet, but given the classic hotel look seen in the 2004 video, this one has the potential to fall into my “Victim of a bad renovation” category. We’ll see. At least someone is looking after it and appears to be doing a good business. As for the school, we stumbled across it on our way out of town to the south. Clearly marked as Ferintosh School District #2345, it dates from 1940. 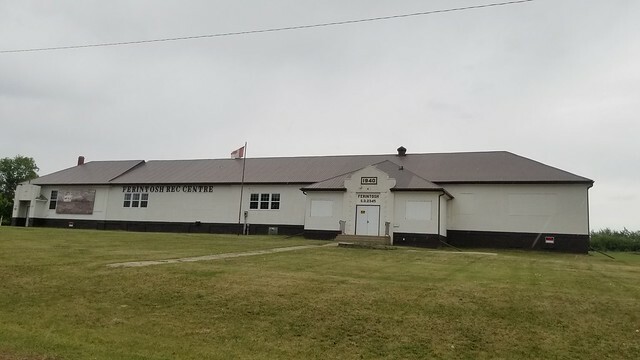 There has been some expansion done to it in the years since and its most recent function was to serve as the Ferintosh Recreation Centre. Today the school sits partially boarded up and marked as both “No Trespassing” and “For Sale”. I can’t imagine there is much a market for such a building simply because of the size — the cost of maintaining and heating such a facility would be enormous. It won’t go down as one of my favorite old schools of all-time, but at least it still exists. So, that’s it from our flash through Ferintosh. I have seen picture of the grain elevator which once stood here and I’m sorry I missed the chance to see it. Having seen photos of it and given the location of the tracks right along the shore of Little Beaver Lake, it would have certainly been quite the sight. So, what do you know about Ferintosh? Do you know the history of the church or the owners who are renovating the hotel? Interested in buying the school? Let us know down in the comments. 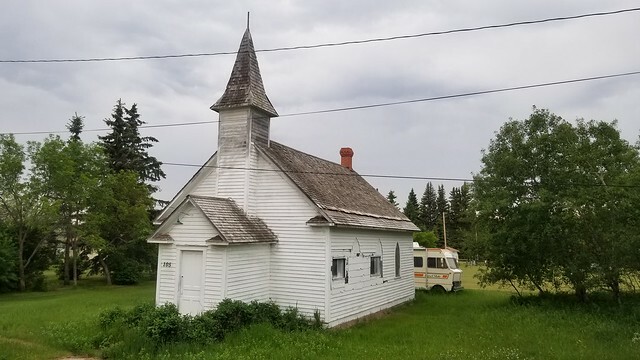 This entry was posted in History, Travel and tagged Alberta, Canada, church, Ferintosh, history, hotel, John McLeod, Little Beaver Lake, school. Bookmark the permalink. The church was Zion Lutheran built in 1916, closed 1967. There is another neat building there, it used to be the Alberta Bible College and is now a B&B. Thanks Jenn. That’s great information. That would mean it has now been closed for the same number of years it was active.